Express yourself with our New stainless "Filigree" Medical Tag. Your very own custom created Italian charm links bracelet. Now you can have peace of mind with style in our 9mm stainless steel Italian Style starter link expansion bracelet. 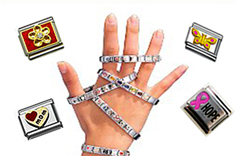 Have fun your bracelet with extra charm links sold separately. Shown here with pink links. Medical Tag flips over for easy access to your life-saving info. 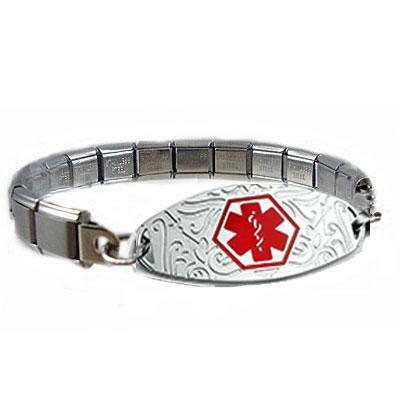 Price includes one Filigree stainless medical id tag with free laser engraving, one starter link bracelet + 2 extra sizing links & FREE charm key tool. No further discounts on this laser engraved bracelet. Sizing - Please measure carefully before you order. Wrap a soft tape measure around the wrist where it bends. 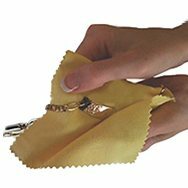 Select your accurate wrist measurement from drop down menu and we will send your bracelet to fit you with 2 FREE links and a FREE charm key tool to add or remove links and adjust for comfort. Please note that enamel colored bands are not as durable the stainless bands and may chip and come off if you are active.